As the QAI, in association with ETI organises its 15th annual Software Testing conference, it brought together staffs in the software testing environment, at various designations from some of the tech-based companies. The conference instilled broader views to enhance and empower an individual's growth. Read on to know more! 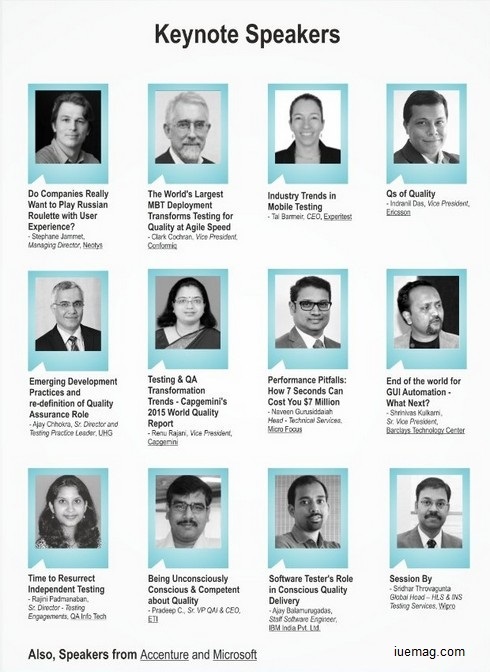 With hundreds of folks from the top tech-based companies like Accenture, Microsoft, Neotys, Experitest, Capgemini joining hands to learn from the technology experts and from some of the research papers that were presented at the 15th Annual International Software Testing Conference 2015, organised by QAI in association with ETI, the event was successful in mutual exchange of knowledge and information for every delegate participating at the conference. The STC '15 which mobilized employees from various organizations to the Park Plaza, Bengaluru on the 3rd and 4th of December, 2015, also became the platform for the senior management of the companies to network with each other. You could get a glimpse of the happenings of the first day of the event from these two links - "The 15th annual Software Testing Conference Day One: The Opening Note" and "Testers' Mania! International Software Testing Conference 2015 - Day 1" The events were followed by more such inspiring occurrences on the second day of STC '15. Keynote speeches were stated by some of the best leaders of the companies, who presented on subjects that would be most appropriate to help enlighten the testers on various disciplines of testing. Ajay Chhokra, Senior Director and Testing Practice Leader at UHG shared his views on quality assurance and how better the quality assurance team could perform to boost their roles. He also discussed on the emerging development implementations. This apprising speech was followed by the keynote of Tal Barnier, who is the CEO of Experitest. Tal created an interactive environment, where she discussed on the emerging trend of mobile applications and the current market. She also illustrated the importance of quality assurance of mobile applications and about the effects of continuous integration and full automations in mobile applications. The presentation on the industry trends in mobile testing by Tal closed with the introduction of Clark Cochran, Vice President of Conformiq, who gave a brief about the world’s largest MBT deployment that transforms testing for quality at agile speed. STC also became a platform to showcase the products of these companies along with the keynotes. Research papers on some of the emerging technology trends were produced in parallel sessions. Papers on subjects like effective acceptance test automation, selecting GUI automation testing tools for mobile domain, cloud based browser compatibility, digital readiness testing, testing of multilingual automatic ticket vending machine, fault injection testing of automotive software using SiLs technique, data validations among heterogeneous big data sources, were all produced by the senior staffs from QA Infotech, Hexaware Technologies, Adobe, PayU India Pvt. Ltd, Mando Softtech India Pvt. Ltd, L&T Infotech Fiserv India Pvt. Ltd, ITC Infotech, Excelacom Technologies, ADP Pvt. Ltd and Amdocs. Simultaneously, there were poster sessions by the staffs from companies like Xpanxion International Pvt. Ltd, Support.com, Deloitte Consulting Pvt. Ltd, Broadridge Financial Sollutions Pvt. Ltd, Quest, Capgemini India Pvt. Ltd SFO Technologies Pvt. Ltd, IBM India Pvt. Ltd, and many more. There were stalls setup for some of the conference partners like Microsoft and Neotys, where they presented their latest products. The parallel sessions continued with networking time along with lunch, after which, some of the best discussions on quality, GUI automation, and Independent testing were presented. Pradeep C, Senior VP, QAI and CEO, ETI presented in an interesting way about being conscious and competent about quality and how the testers in the organization could contribute in an improved manner towards quality of the developing products. The delegates explored what could be the next big thing with the end of the world for GUI Automation, which was presented by Shrinivas Kulkarni, Vice President at Barclays Technology Center. Interactions on the evolution of conscious quality was once again expressed with the delegates by Shridhar Throvagunta, Global Head - HLS&INS Testing Services, Wipro. The difficult part of any event is the last session, when a lot of participants would have already been exhausted. Rajani Padmanabhan, Senior Director - Testing engagements, QA Infotech, presented it truly impressive for the whole crowd to stay alert and understand the importance of independent testing. Rajani made it more interesting by uniquely sharing how the companies need to revitalize independent testing of products. As the sessions ended, it was time to reward the best research paper presented. Out of 562 papers submitted, they were all scrutinized to 268 considering the major mistakes in the abstracts, right use of the language and relevant subject matters. Then, 6 best presenters from each of the 6 cities of India, which participated, were chosen for the final round of presenting at the grand annual conference of STC ’15. With the clock ticking at 05:00 pm and the hearts of the presenters beating continuously, the finalist, Mohit Anand from Adobe, who presented on ‘Selecting GUI automation testing tools for mobile domain’, was chosen to be the best of all and was awarded the same, while the second runner-up team was Sumanth MR and Uday Kiran K from First American India Pvt. Ltd., whose presentation was about ‘Quantifying the quality of agile’, and the first runner-up team was Ashwini Phalle and Vijay Dixit from Fiserv India Pvt. Ltd., who presented their papers on ‘Responsive web design and its impact on testing world’. With the whole new experience of understanding the testing world better, most of the delegates went back with new viewpoints. Delegates who were present, but not the first time, took away more learnings with broader perspectives than the previous time. An association that brought together staffs from various companies, succeeded in giving the best results to every participant at the conference, while the organizers experienced an event that they would cherish for lifetime, for having been the reason for every person to have got the experience at the conference, and also took back learnings to make it better for the next one. Such collaborations only make a better environment for the next generation. The rate of growth of the economy shall only increase with more such alliances, which will not only help an individual enhance his knowledge, but also morally support his/her growth at a faster rate, which is bound to develop the country’s wealth.